On 29 September 2016, DRS operated train 1Z49, the 10.21 Eastleigh to Paignton powered by Class 37s Nos. 37601 and 37612. 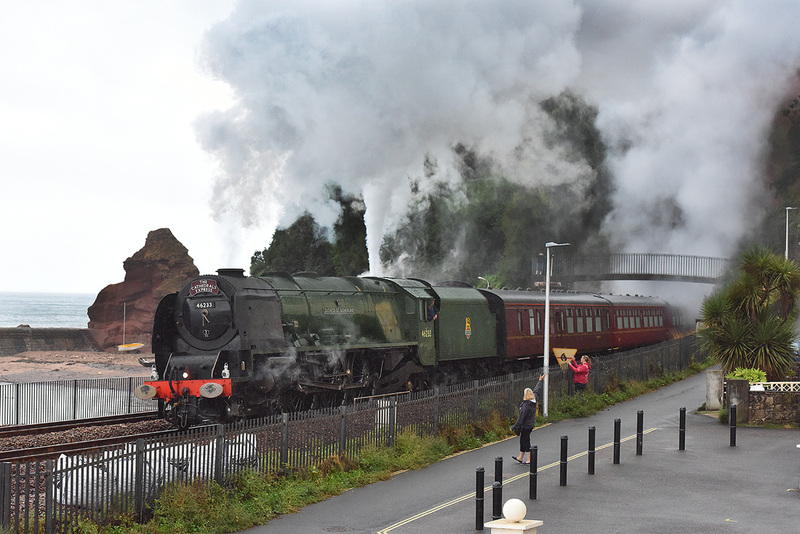 The train was a positioning move for this weekends Paignton to Scotland 'Autumn West Highlander' charter. 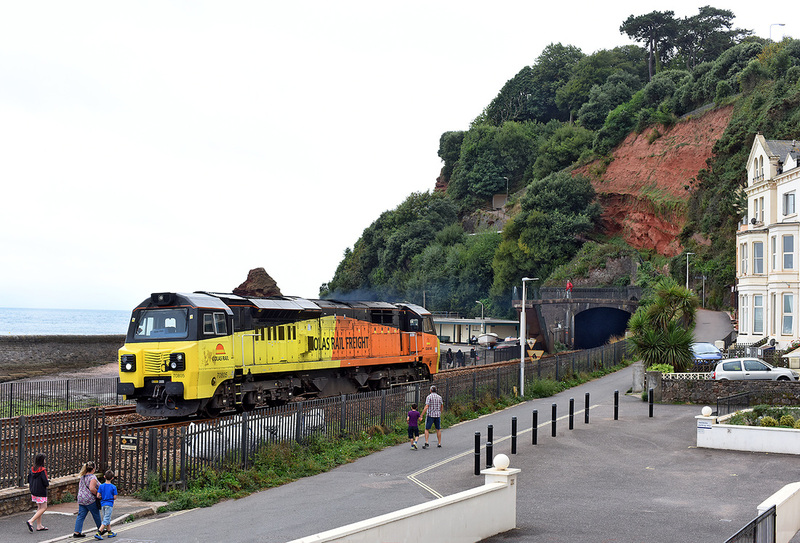 The train is seen passing Dawlish station en route to Paignton. Although the sun was out, it was not in a good position for that time of day and a westbound train. Colas Rail Freight Class 70 No. 70807 up Dawlish Black Bridge, 6C97, 08.30 Totnes - Westbury empty rail delivery train, 18 September 2016. The return run of The Cornishman 1Z60 16.25 Penzance to Tame Bridge Parkway, powered by No. 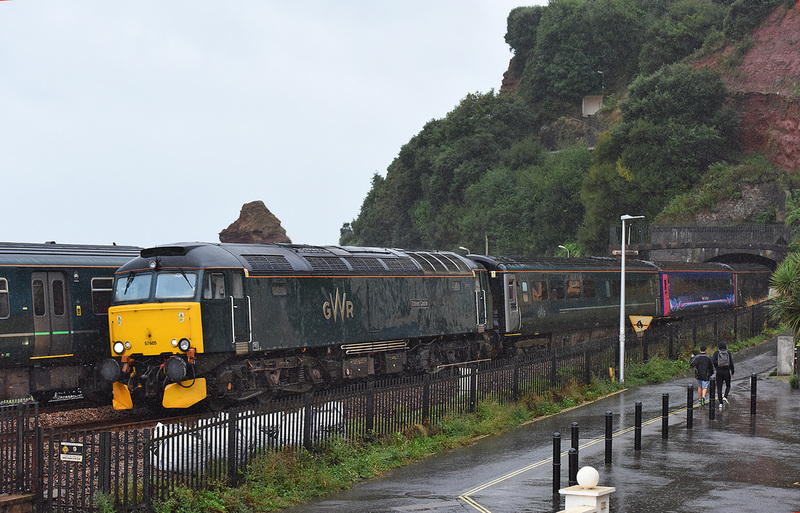 D1071 (D1015) storms through Dawlish on 17 September 2016 running some 22 mins early. Great sight and great sound. Almost dark when it went by. 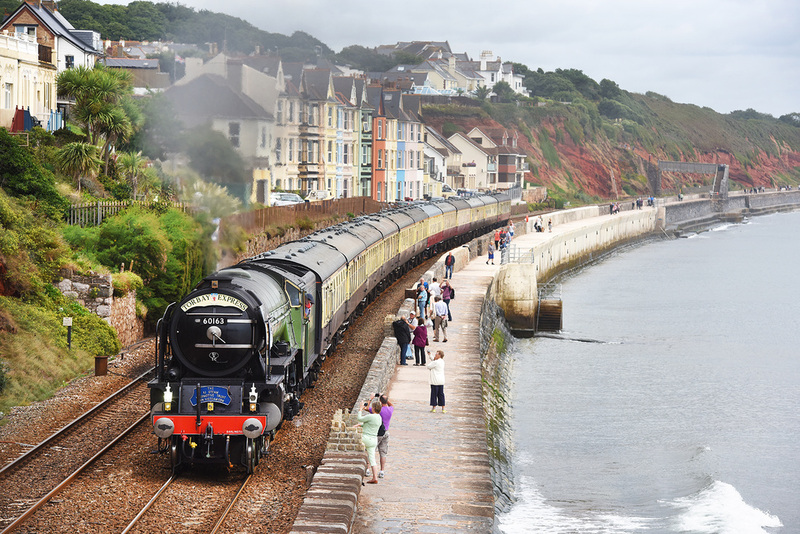 After LNER locos now its LMS power through Dawlish. No. 6201 Princess Elizabeth heads towards Kennaway Tunnel from Dawlish station on 17 September 2016 powering train 1Z84, 16.23 Exeter St Davids to Penzance. VERY little could ever improve on the sight of a 'Western' traversing the South Devon Sea Wall. Today 17 September 2016 DTG-owned No. D1015, running as No. D1071 Western Renown powered 'The Cornishman' charter 1Z59, the 05.07 Tame Bridge Parkway to Penzance. 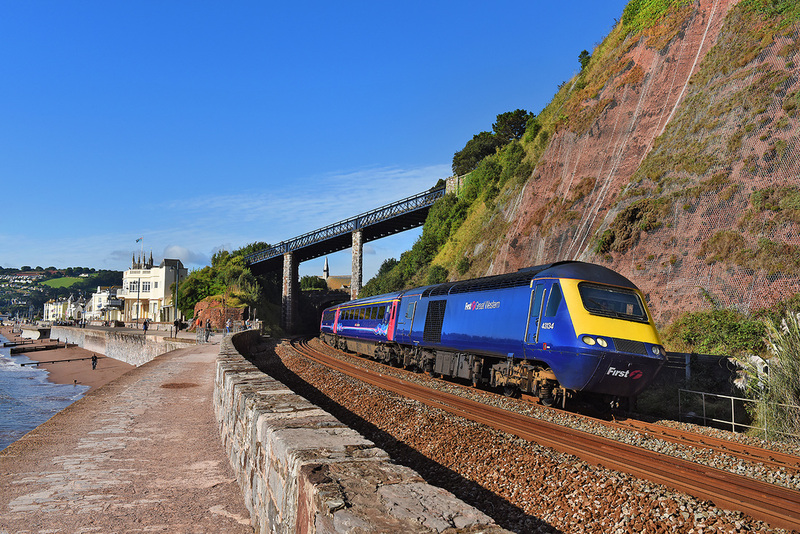 The train is seen on the Teignmouth Sea Wall at Sprey point. The opening of the power handle and a little 'toot' from the driver, brought back those wonderful memories of the mid 1970s on the Sea Wall. Class 153 No. 153305 and Class 150/9 No. 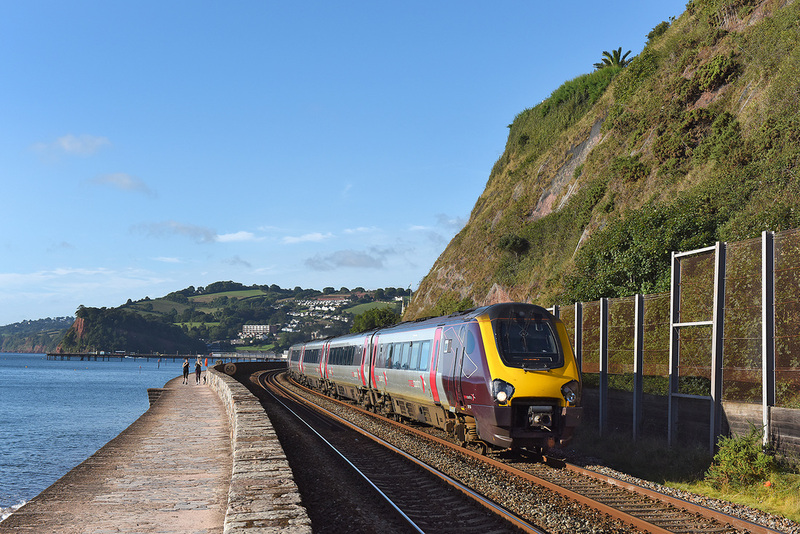 150926 departs from Teignmouth, 2E17 09.30 Paignton - Exeter SD, 17 September 2016. 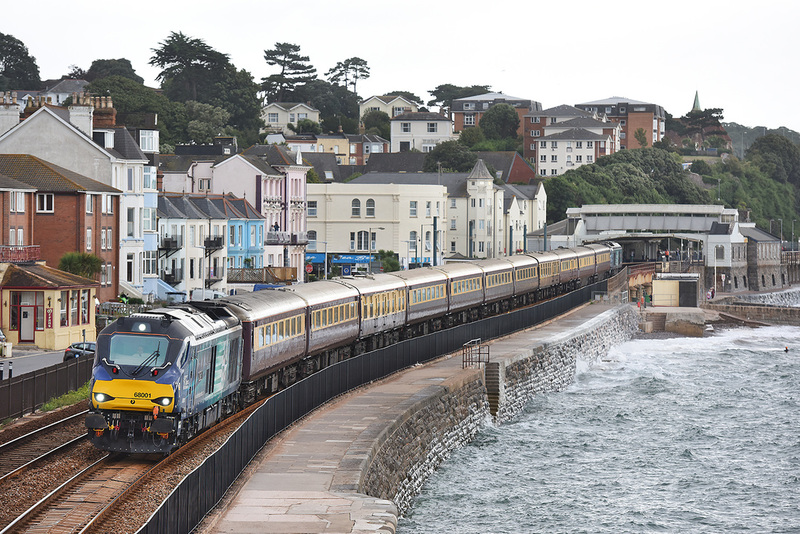 43134 departs from Teignmouth, 1A15, 09.18 Paignton to Paddington, 17 September 2016. 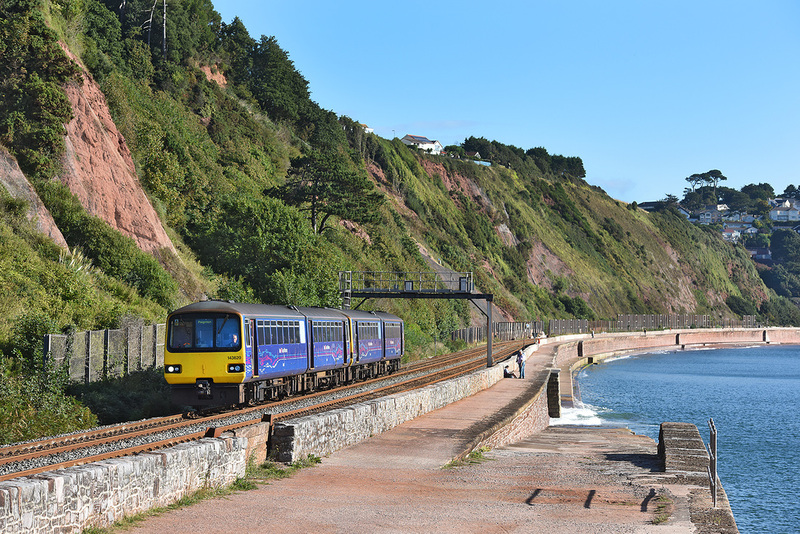 143620 plus another set heads towards Teignmouth on 17 September 2016 forming train 2T10, 08.21 Exmouth - Paignton (running wrong line). 221133 passes Teignmouth, 1S43, 06.30 Penzance - Newcastle. 17 September 2016. EWS-liveried Class 66 No. 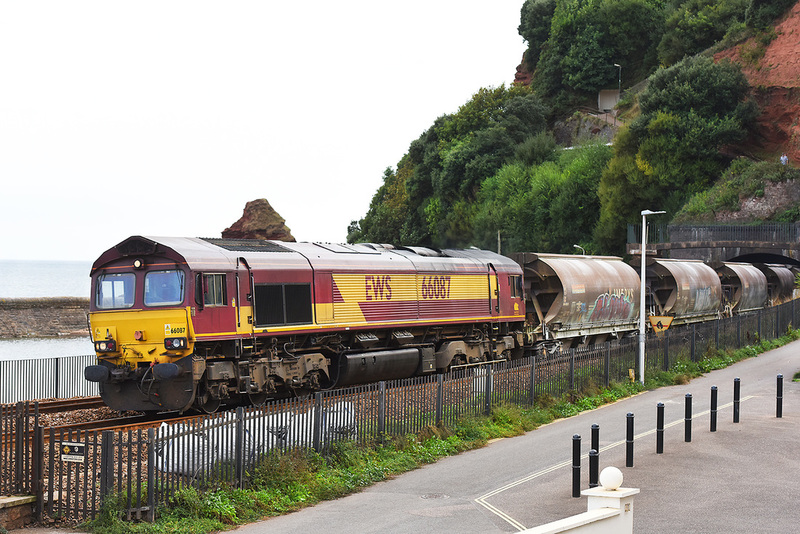 66087 emerges from Kennaway Tunnel, Dawlish on 15 September 2016 powering train 6C53, 14.50 St Blazey - Exeter Riverside loaded clay formed of 11 vehicles. Adds a bit of colour to a VERY dull morning in Dawlish on 13 September 2016, with a storm going through the Channel. 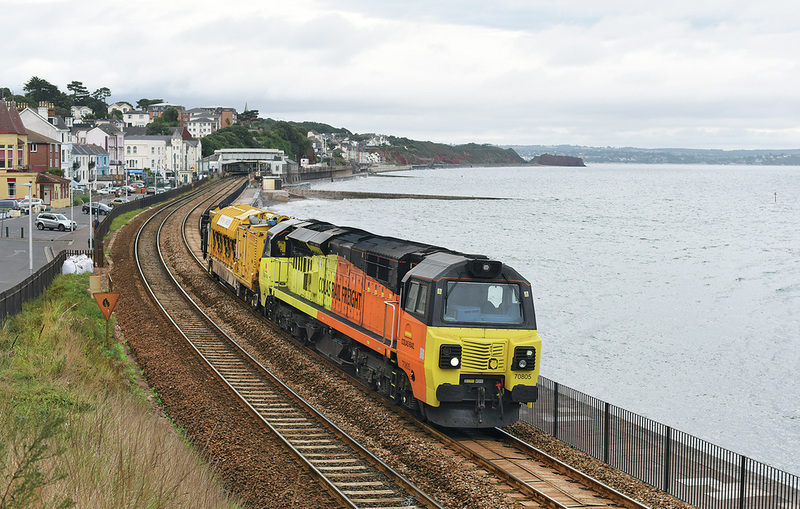 Colas track machine DR73805 heads west through Dawlish running as 6J94, 10.02 Tiverton Junction Loop to Tavistock Junction. 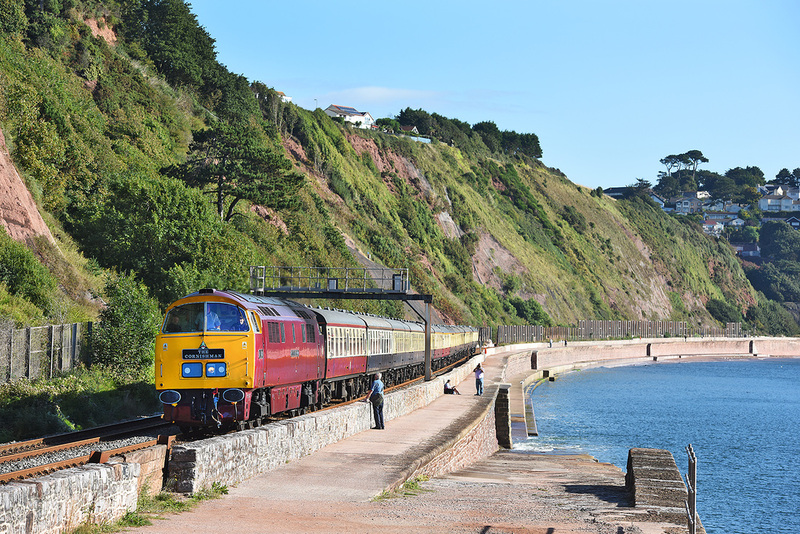 At the tail end of a nice sunny afternoon in Dawlish on 11 September 2016, the return 'Torbay Express', the 1Z28, 16.50 Kingswear to Bristol Temple Meads via Westbury and Bath, powered by No. 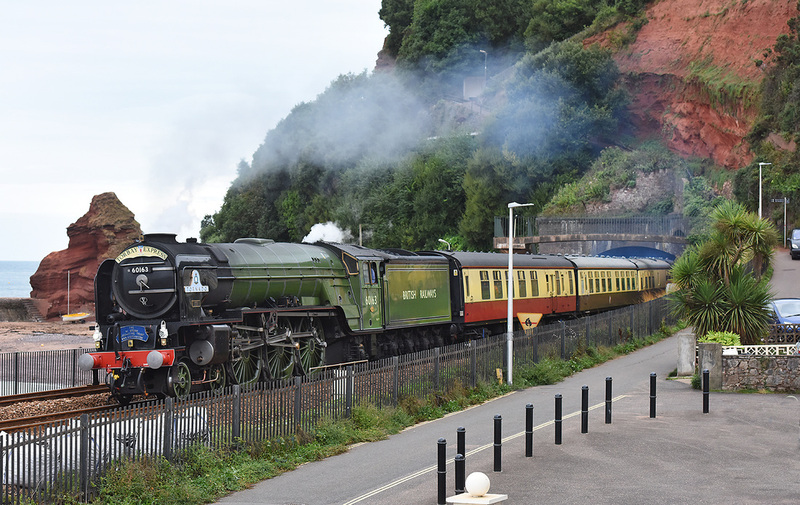 60163 Tornado catches the last rays of light as it skirts Marine Parade between Kennaway Tunnel and Dawlish station. Only a handful of watchers turned out. I don't know, i just can't get excited about this loco working the 'Torbay Express', the entire season without a GW loco working the train. 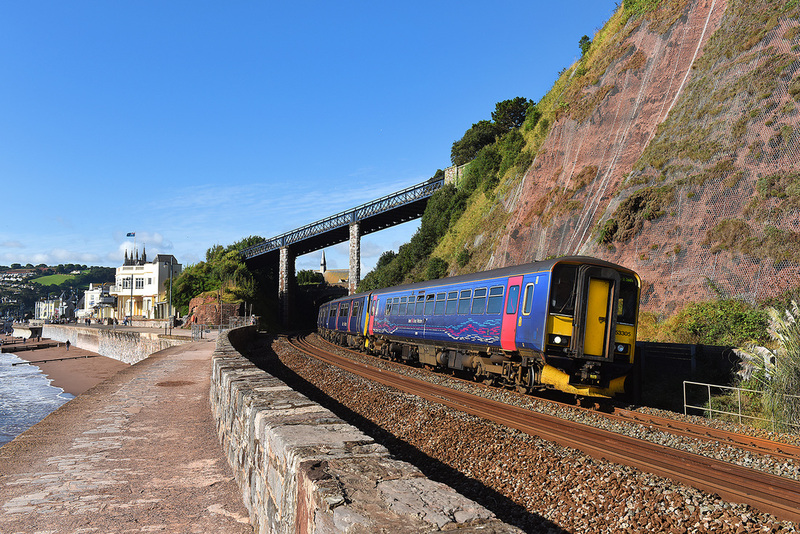 However, on the last day of the 2016 Torbay Express season on 11 September 2016, No. 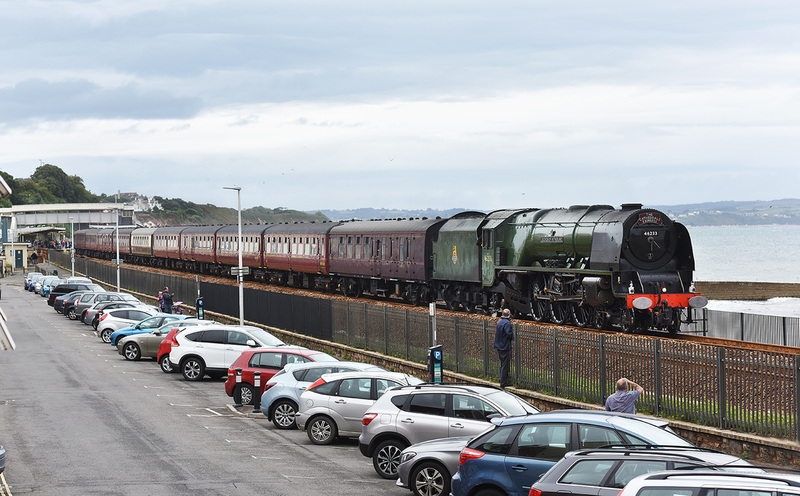 60163 Tornado takes the curve at Dawlish Warren with train 1Z27, the 08.00 Bristol Temple Meads to Kingswear via Bristol and Westbury. The DB Management Train, powered by Class 67 No. 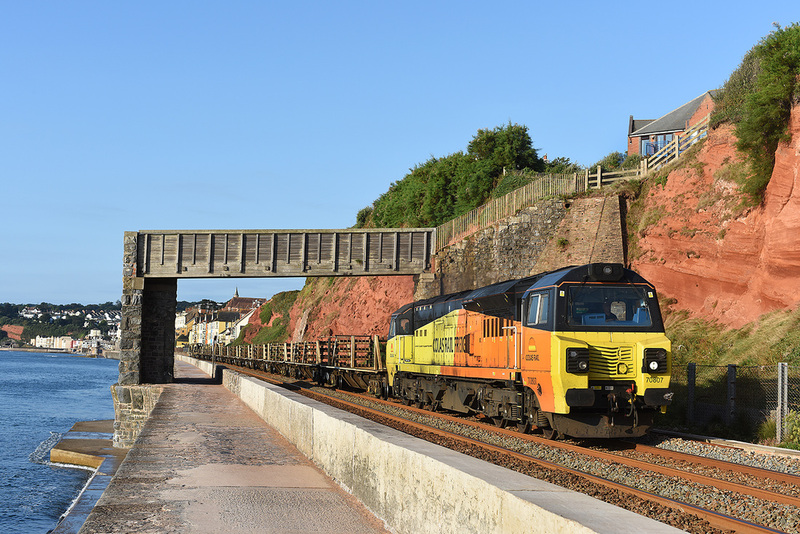 67029 visited the West Country on 9 September 2016 forming 1Z05, the 08.43 Newport (Gwent) to Newport (Gwent) via Newton Abbot, with the Class 67 on the rear, the train approaches Dawlish on its return run. The Great Western daytime Sleeper services for tired passengers and staff operated on 4 September 2016, as 5Z70, 11.20 Penzance to Royal Oak Sidings (Paddington). Powered by Class 57/6 No. 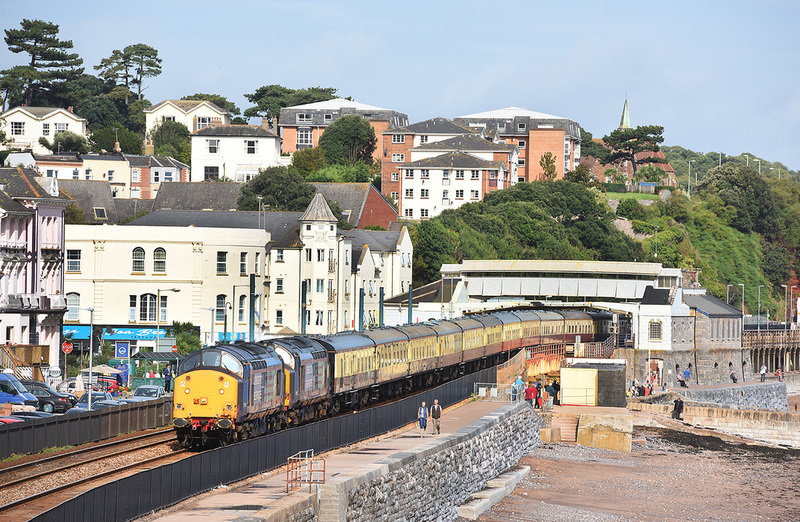 57605 and formed of last Friday nights 'up' sleeper stock, the train passes Dawlish during the early afternoon. 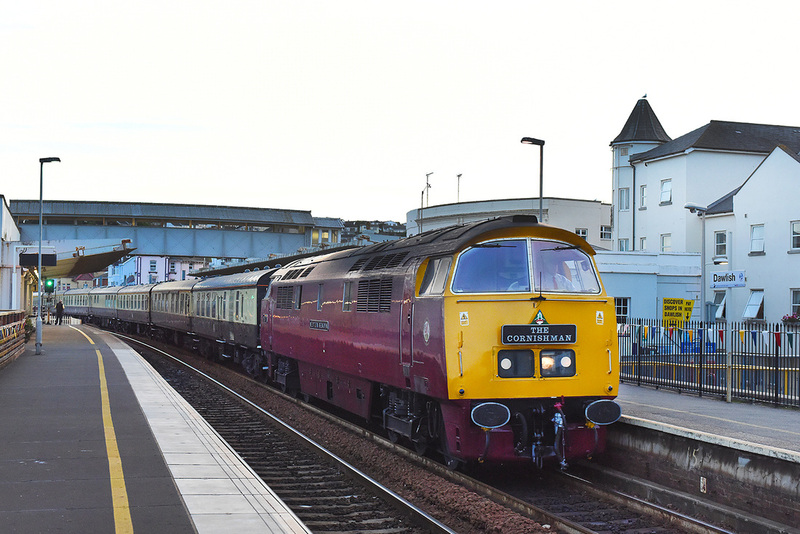 The sleeper service from Penzance to Paddington on Friday night/Saturday morning was formed of an HST set following failure of the Class 57 which had a DSD fault. 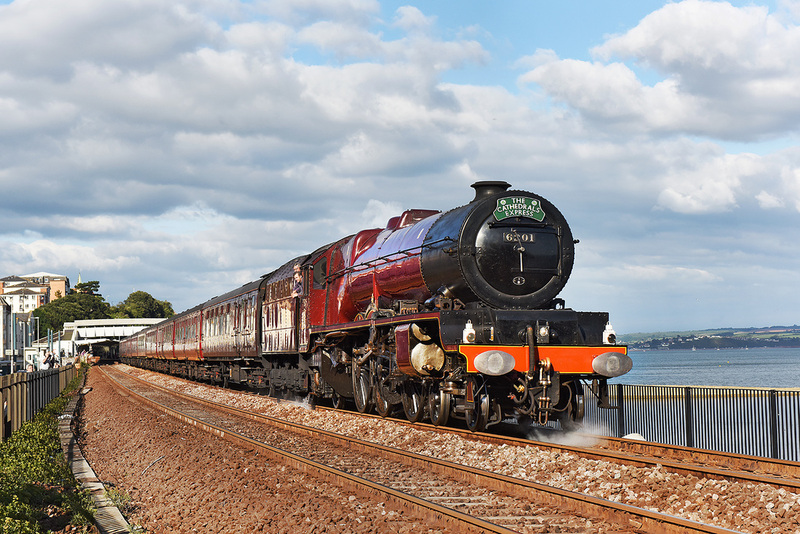 The return of the 'Torbay Express' on 4 September 2016, 1Z28, 16.50 Kingswear to Bristol powered by No. 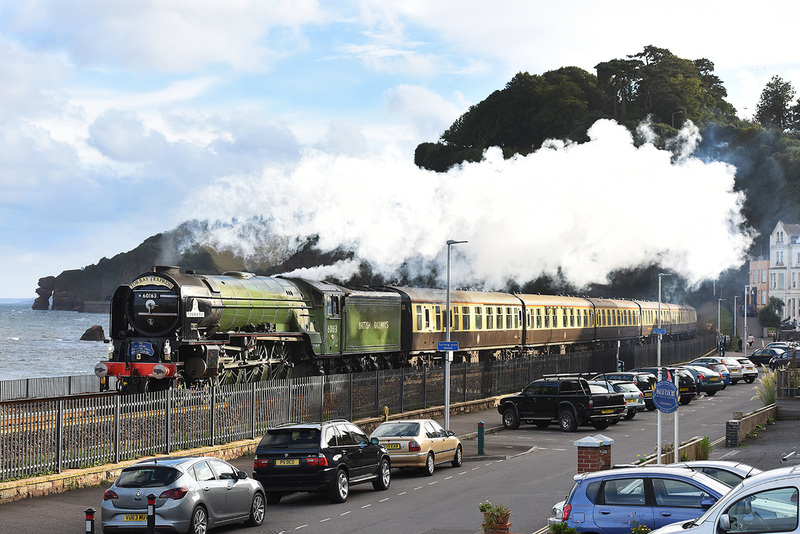 60163 Tornado, emerges from Kennaway Tunnel, Dawlish, making one hell of a noise as its steam whistle was jammed open! On 4 September 2016, the 'Torbay Express' was powered by A1 No. 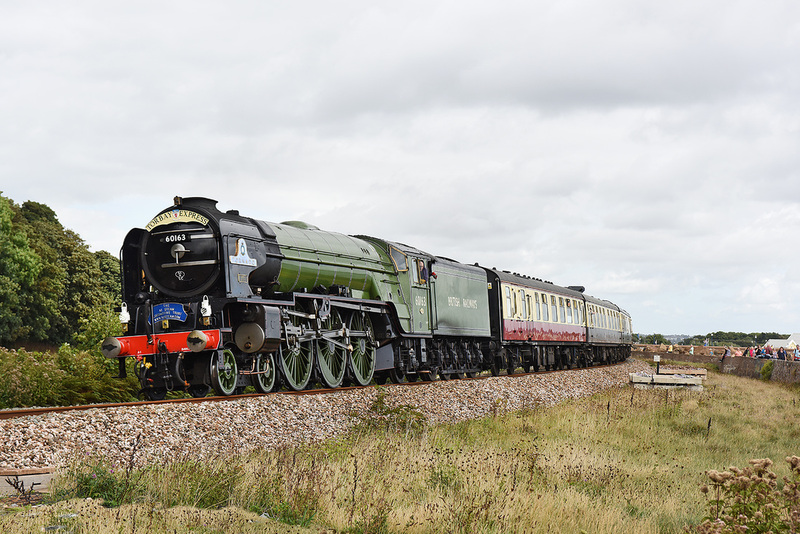 60163 'Tornado'. 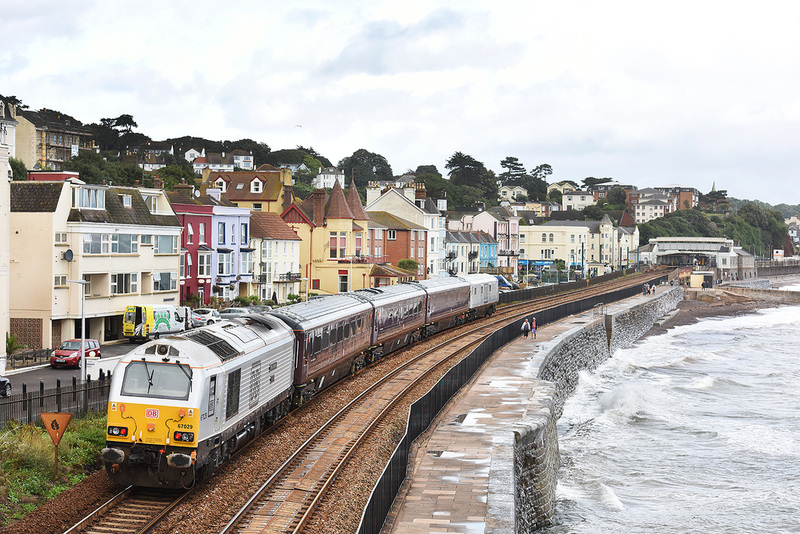 The westbound train is seen passing along the Dawlish Sea Wall, viewed from the Coastguards footbridge in medium light. At least the rain has stopped. Quite a few out for todays steam. All these trains in Dawlish today, ill need to have a sit down, or a beer. DRS No. 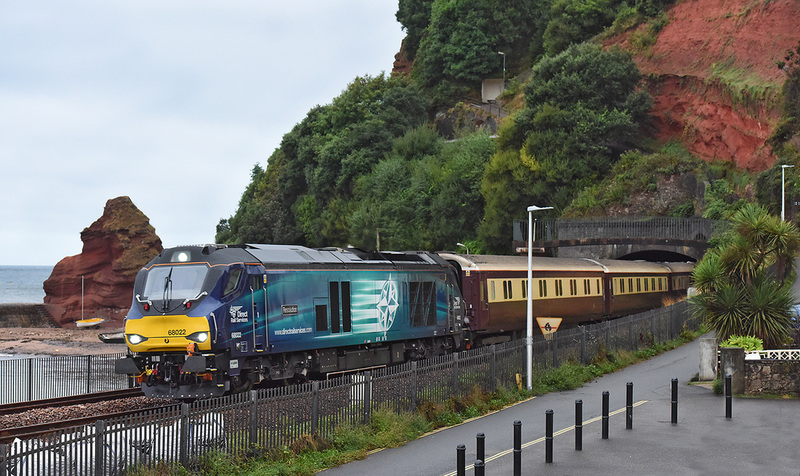 68022 storms out of Kennaway Tunnel on 3 September 2016 with the returning Northern Bell charter, train 1Z54, the 15.30 Penzance to Birmingham International. LMS 'Duchess' No. 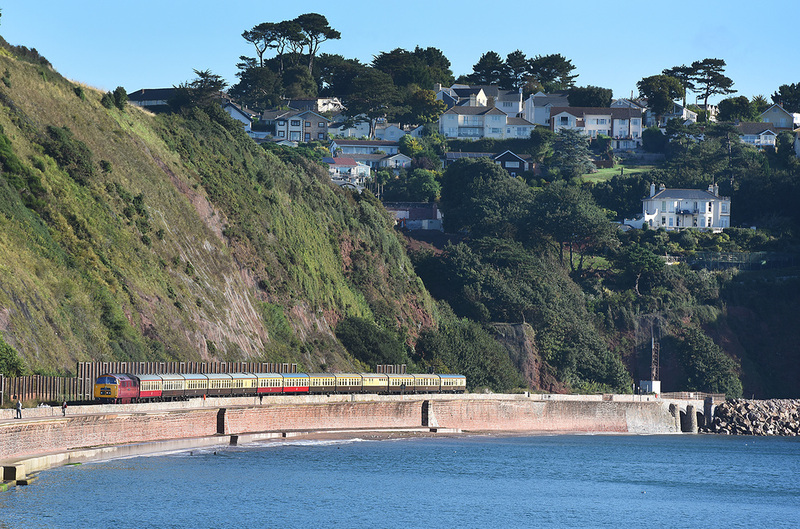 46233 Duchess of Sutherland, emerges from Kennaway Tunnel, Dawlish powering the slightly late running 1Z44, 16.12 Kingswear to Paddington on 3 September 2016. Long time since I've seen smoke quite like that! Camera cranked up to 5000ISO. On 3 September 2016, Great Western Class 57 No. 57605 emerges from Kennaway Tunnel is DREADFUL light, powering 2E75, the 13.35 Plymouth to Exeter St Davids. It was so dull that i used an ISO of 3000 to get an exposure of 1000 f 5.6. Class 47 No. 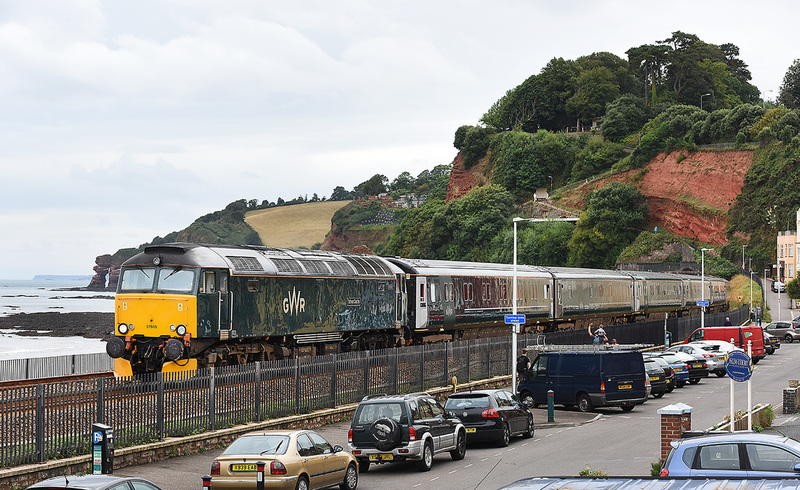 47580 County of Essex coupled on the rear of 1Z43 the 07.09 Paddington to Kingswear on 3 September 2016, seen about to go into Kennaway Tunnel, Dawlish. The train was powered by LMS 'Duchess' No. 46233 Duchess of Sutherland, which powered the train between Taunton and Newton Abbot. 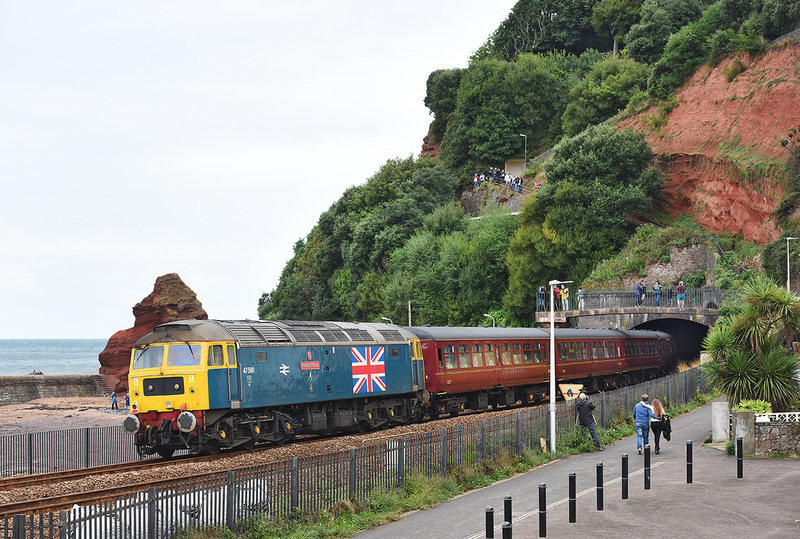 Seen in the illustration below approaching Kennaway Tunnel, Dawlish. 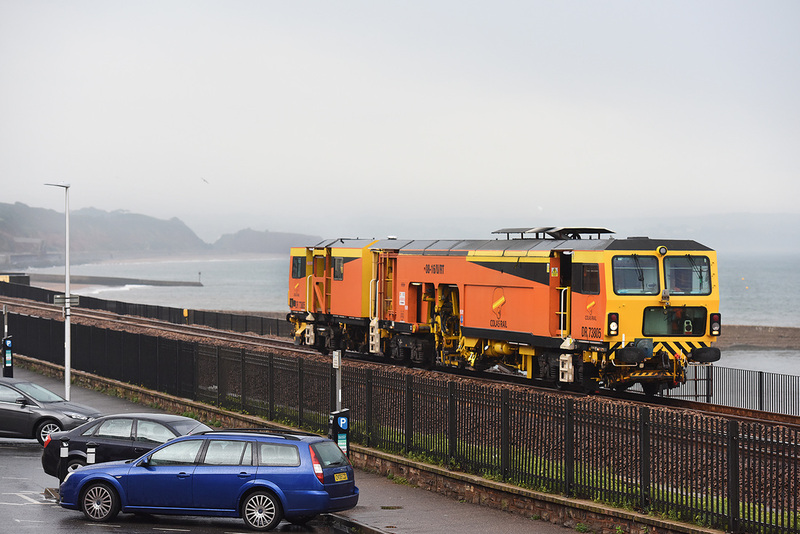 Those nice boys and girls from Colas Rail Freight provided a little colour for a rather dull Dawlish morning on 2 September 2016. Class 70 No. 70805 plus Rail Vac vehicle 709515004 8 head west as train 6X54, 07.54 Westbury to Burngullow running about one hour early. After leaving the RailVac at Burngullow on 2 September 2016, Class 70 No. 70805 returned light to Westbury running as 0C54, 14.05 Burngullow to Westbury running some 15min early. Seen emerging from Kennaway Tunnel.